Analysis: Gallman passes the eye test, showing quickness and decisiveness in the hole, but averaged only 3.5 YPC (albeit in a small sample), had three drops, and his 6.4 yards per catch as a receiver was below par. At best he remains Barkley's backup, and there's some chance the Giants bring in competition for him. 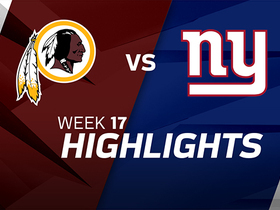 Analysis: Gallman handled a season-high 14 carries in a blowout win over the Redskins in Week 14 but his usage has predictably tailed off in the Giants' back-to-back losses. The Giants have no reported plans to restrict top back Saquon Barkley's workload in the season finale against Dallas this weekend, so another limited workload is likely on tap for Gallman. Analysis: Gallman logged exactly five carries and two targets for the second straight game. The second-year pro saw a slight increase in offensive snaps (15) Week 13, but for fantasy purposes has little value other than as a backup to workhorse Saquon Barkley. Analysis: Gallman continues to see limited opportunities behind workhorse Saquon Barkley,with the 14 snaps Gallman received Sunday actually marking his highest total since Week 6. The second-year back out of Clemson should be viewed as little more than a handcuff to Barkley for fantasy purposes. Analysis: It's possible Jonathan Stewart (foot) returns from IR soon, but Gallman is the most likely back to inherit Saquon Barkley's carries were Barkley to get hurt. Gallman carried the ball twice for three total yards during Monday's 27-23 win over the 49ers. Analysis: The two touches marked Gallman's largest haul since Week 6. Gallman showed promise as a rookie in 2017 but has taken a seat in the way back for the Saquon Barkley Show. 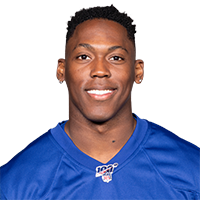 Gallman has accounted for fewer than 10 percent of the Giants' carries this season and has not topped 45 total yards or scored a touchdown in a game this season. Tampa Bay, Sunday's opponent, features a pretty average run defense giving up 4.4 yards per carry, but Gallman is unlikely to get enough carries to take advantage. Gallman logged one carry for a loss of one yard during Sunday's 13-20 loss to the Redskins. Analysis: Gallman remains quiet in his limited role behind Saquon Barkley, and is averaging less than 10 offensive snaps per game. Despite being the clear No. 2 option in New York, Gallman does not warrant fantasy attention as long as Barkley remains healthy. Gallman did not receive a carry across his five offensive snaps in Monday's loss to the Falcons. Analysis: Gallman flashed his pass-catching abilities last week against the Eagles, recording two receptions for 25 yards, but the back failed to see any targets on Monday night. Given his limited action, Gallman doesn't warrant any fantasy relevance in the near future. Gallman had four carries for 17 yards and caught two of five balls for 25 yards in Thursday's 34-13 loss to the Eagles. Analysis: With Saquon Barkley around, Gallman's role is small, but he broke tackles on a nice catch and run and looks like a complete back. Moreover, should anything happen to Barkley, Gallman is the clearly defined No. 2. Gallman played in eight offensive snaps in Sunday's loss to the Panthers and did not receive a single carry. Analysis: The more rookie running back Saquon Barkley impresses, the less work Gallman is going to get, as seen in Sunday's game. It looks like Gallman's workload will be increasingly dependent on when Barkley needs a breather, as the rookie has become a very reliable contributor for the Giants. Gallman had two carries for six yards and caught all three of his targets for 17 yards Sunday against the Saints. Analysis: Gallman is the clear backup to Saquon Barkley now that Jonathan Stewart is on IR, and Gallman will be the change-of-pace option on the rare occasion Barkley needs a breather. Gallman recorded 25 yards on six carries in Sunday's win over the Texans. Analysis: Gallman saw more work out of the backfield than his one rush attempt in last week's loss to the Cowboys, and it appears as though he has emerged as the clear No. 2 tailback for the Giants, as Jonathan Stewart only rushed the ball twice against Houston. However, Gallman will have no fantasy value unless starter Saquon Barkley is inactive. Gallman rushed one time for two yards and caught one pass for 11 yards in Sunday's 20-13 loss to the Cowboys. Analysis: While Gallman appears to be the clear No. 2 in the backfield behind Saquon Barkley, there doesn't appear to be much work available given the rookie's heavy usage Sunday night. Barkley not only rushed the ball 11 times for 28 yards, but he was also targeted 16 times in the passing game and posted a team-high 14 receptions. An expanded opportunity would likely only come for Gallman should Barkley suffer an injury. Gallman (knee) logged a full practice Friday and doesn't have a designation on the final injury report for Sunday's game in Dallas. Analysis: Gallman was a limited participant Wednesday and Thursday after suffering a minor knee sprain in last week's season opener against Jacksonville. He's been cleared to face the Cowboys on Sunday, but he won't see much work playing behind Saquon Barkley. Gallman (knee) was limited at Wednesday's practice. Analysis: After spraining his left knee Week 1, Gallman was able to handle individual drills Wednesday, according to Paul Schwartz of the New York Post. Considering the nature of the injury, Gallman may not increase those practice reps this week, but he remains the preferred option at running back behind rookie workhorse Saquon Barkley, if healthy. Gallman said he sprained his left knee during Sunday's 20-15 loss to the Jaguars but expects to be ready for the Giants' Week 2 matchup in Dallas, Art Stapleton of The Bergen Record reports. Analysis: Gallman was removed in the third quarter of the season opener with three touches to his name for eight yards. It's the Saquon Barkley show in New York, as evidenced by 20 touches for 128 yards and one touchdown Sunday, but there's apparently some room for weekly touches, if Gallman is healthy. A precautionary MRI on Monday could determine Gallman's fate in the short and perhaps long term. Gallman is questionable to return to Sunday's game against the Jaguars due to a knee injury. Analysis: Prior to his departure midway through the third quarter, Gallman was a small part of the game plan, notching one carry for minus-one yard and corralling both targets for nine yards. If he needs to focus any time on rehab, veteran Jonathan Stewart will elevate to rookie Saquon Barkley's direct backup. Gallman is listed as the No. 2 back on the Giants' depth chart, Paul Schwartz of The New York Post reports. Analysis: Gallman will be the primary backup behind rookie Saquon Barkley heading into Week 1, with veteran Jonathan Stewart listed as the No. 3 back. Stewart did not fare well during the preseason, which included a three-carry performance for minus-seven yards and a fumble against the Jets. Gallman also is a better receiver out of the backfield, which likely played a role in team's decision to give him the No. 2 spot. 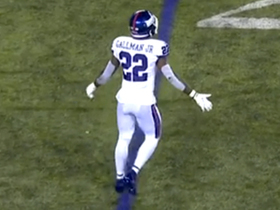 Gallman rushed 11 times for 23 yards and secured all four of his targets for 19 yards in the Giants' 22-16 preseason win over the Jets on Friday. Gallman rushed five times for 26 yards and a touchdown in addition to catching both of his targets for nine yards and another score during Friday's preseason game against the Lions. 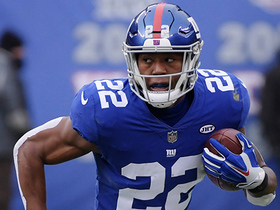 Analysis: With Saquon Barkley (hamstring) sitting this one out, Gallman easily looked like the Giants' best running back -- especially compared to Jonathan Stewart, who carried four times and netted minus-one yard. The 2017 fourth-rounder will get another chance to make his case for the No. 2 role during next week's exhibition against the Jets. Gallman finds himself in a New York backfield that added No. 2 overall draft pick Saquon Barkley after signing 31-year-old Jonathan Stewart in March, Dan Salomone of the Giants' official website reports. Gallman recently took part in Eli Manning's passing camp at Duke University, Pat Leonard of the Daily News reports. Gallman carried 15 times for 89 yards during Sunday's 18-10 win over the Redskins. Gallman ran for 39 yards on eight carries and added 40 yards on six catches during Sunday's 34-29 loss to Philadelphia. Analysis: Gallman has now topped 75 total yards in back-to-back games after just one such outing in his previous nine contests of the season. The rookie was a dynamo for Clemson last season and figures to continue to get plenty of looks as the season comes to an end and the Giants look to 2018. He gets a tough matchup in Week 16 against a stingy Arizona front before a favorable finale against Washington's bottom-10 run defense. Gallman could see an increased role in the Giants' game plan over their final three contests of the season, beginning with Sunday's game against the Eagles, Paul Schwartz of the New York Post reports. "You see things that [Gallman] does with the ball in his hands in the open field, he can catch the ball well, he's got speed to the edge," Giants offensive coordinator Mike Sullivan said. "The more we can continue to give him opportunities, he's going to continue to get those chances, both in pass protection and maybe get him in on third down." Gallman carried 12 times for 59 yards and caught seven of nine targets for an additional 40 yards in Sunday's 30-10 loss to the Cowboys. Analysis: Gallman led the team in touches and averaged a solid 4.9 yards per carry, compared to just 2.9 for fellow back Orleans Darkwa. He also set career highs in targets, receptions and receiving yardage while serving as the passing down back after the team got behind on the scoreboard. Gallman was one of the lone bright spots on the day for a Giants team mired in turmoil at the moment, meaning he could maintain a sizable share of the backfield workload next week against the Eagles. Gallman (hip) doesn't carry an injury designation heading into Sunday's game against the Cowboys. Analysis: Gallman wasn't anything more than a limited participant in practice throughout the week, but the health of his hip apparently wasn't enough of a concern for the Giants to label him questionable for the Week 14 matchup. Starting running back Orleans Darkwa (illness) was deemed questionable, but is expected to play against Dallas, leaving Gallman in line for the usual change-of-pace role he's handled in recent weeks. Gallman (hip) was limited at Wednesday's practice. Gallman suffered a hip injury in Sunday's game against the Raiders and is questionable to return. Analysis: Gallman had three carries for 11 yards before exiting. Whether the rookie running back returns to the game or not, Gallman is now a part of a four-headed backfield in New York, with Orleans Darkwa, Shane Vereen and Paul Perkins all getting carries Sunday. He will be hard to trust in any fantasy format as long as the Giants' run game keeps operating as a platoon. 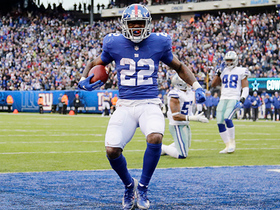 Gallman led the Giants in rushing with 37 yards on nine carries, while also chipping in two receptions for six yards in its Thanksgiving loss to the Redskins. Analysis: The Giants could not get anything going on the ground or through the air in the contest. Fellow running back Orleans Darkwa got 11 carries, so the carry count was essentially split. The rookie will attempt to breakout next week when the Giants face the Raiders. Gallman rushed six times for 19 yards and added a three-yard catch on four targets in Sunday's 12-9 overtime win against Kansas City. Analysis: Gallman ceded the majority of work to Orleans Darkwa, who received 20 carries and found the end zone from one yard out. Darkwa's established himself as the clear top option in New York's backfield, getting 50 carries to Gallman's 18 over the past three weeks. Passing-down back Shane Vereen remains in the mix as well. Gallman had three carries for 22 yards Sunday against the 49ers. He also saw one target, but failed to haul it in. Analysis: Gallman was once again Orleans Darkwa's backup, but Shane Vereen (five carries) also saw work. Former starter Paul Perkins played only on special teams. Consider Gallman the No. 2 and first in line should anything happen to Darkwa. Gallman had nine carries for 41 yards against the Rams on Sunday, but lost a fumble. Analysis: He was once again the backup to Orleans Darkwa (16 carries for 71 yards), and the fumble probably won't advance his cause. Paul Perkins theoretically could come back into the mix against the 49ers, but it's unclear what his role would be. For now, consider Gallman the No. 2 back on the roster. 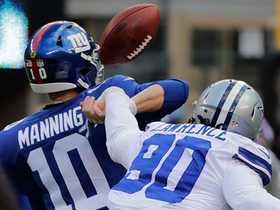 Dallas Cowboys defensive end Demarcus Lawrence forces pressure on New York Giants quarterback Eli Manning for an interception. 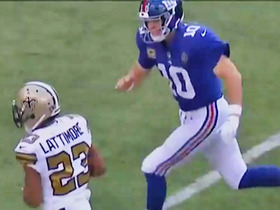 New York Giants running back Wayne Gallman throws arms up after miscommunication with quarterback Eli Manning. New York Giants running back Wayne Gallman throws arms up after miscommunication with quarterback Eli Manning in Week 6 of the 2018 NFL season against the Philadelphia Eagles. 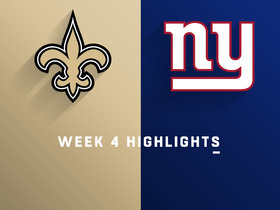 New York Giants running back Wayne Gallman fumbles on the quick pass and New Orleans Saints cornerback Marshon Lattimore recovers. New York Giants running back Wayne Gallman turns on the jets and converts on 2nd-and-20. 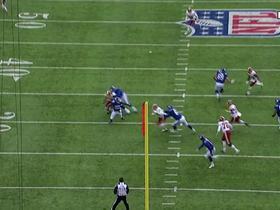 Washington Redskins defensive end Preston Smith isn't fooled, intercepts this screen pass from New York Giants quarterback Eli Manning.